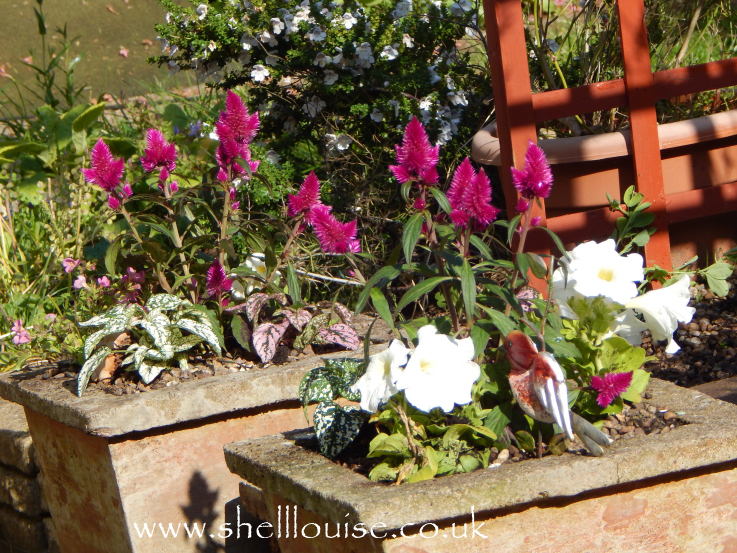 We’ve worked really hard in the garden this week and I’m happy to say things are looking better. We had waterfall problems again and Ant dismantled it for a third time because he thought it still had a leak. Fingers crossed that’s the last time he’ll have to take it apart because it looks really nice the way it is now. The pond water has gone green again so we’ve put some barley straw in. Hopefully, it’ll soon help it clear. We need to get some water lilies because the leaves help shade the water and stop it going green. 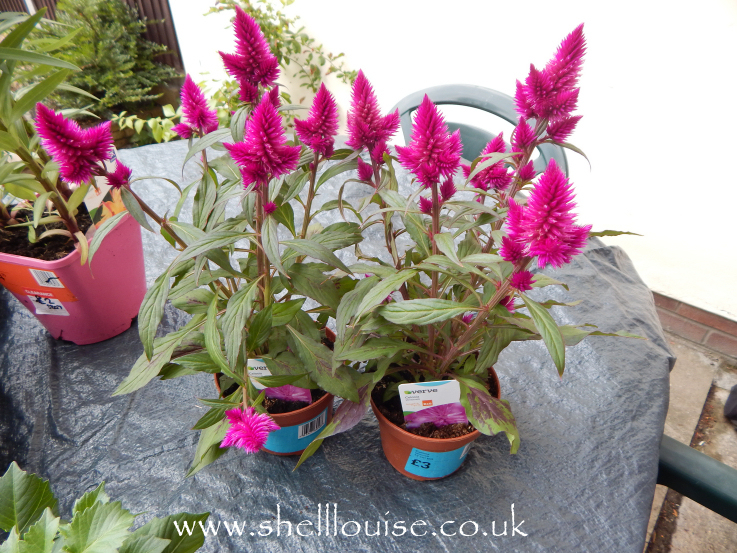 I spent a lovely morning at B&Q on Tuesday, picking plants to put in my pots. I was sick of seeing the ivy in the square stone pots. 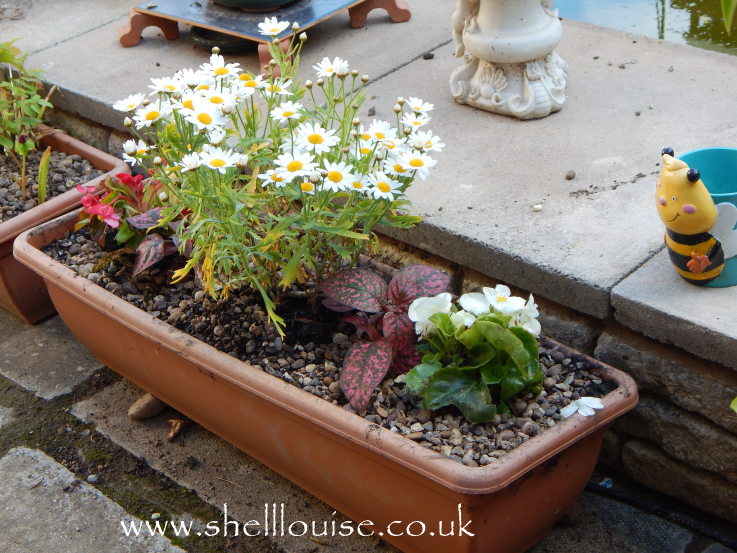 It was all that was left of the winter pots I did a few years ago. 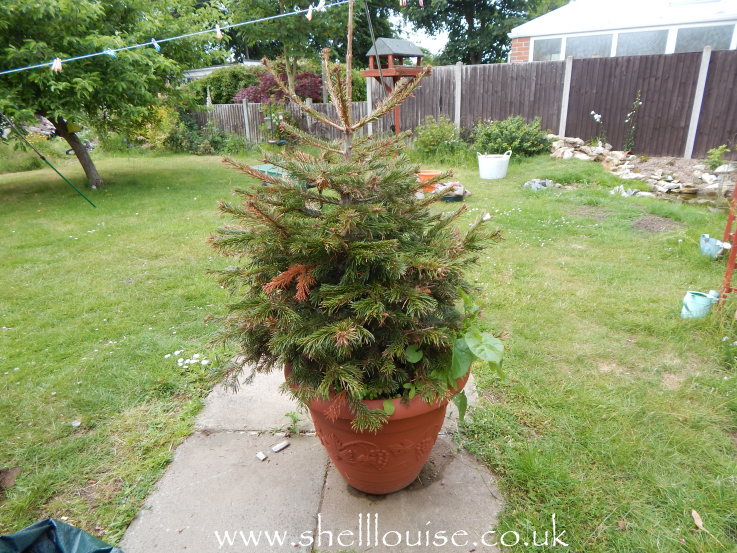 The Christmas tree we bought last year wasn’t doing very well in the big pot we put it in. 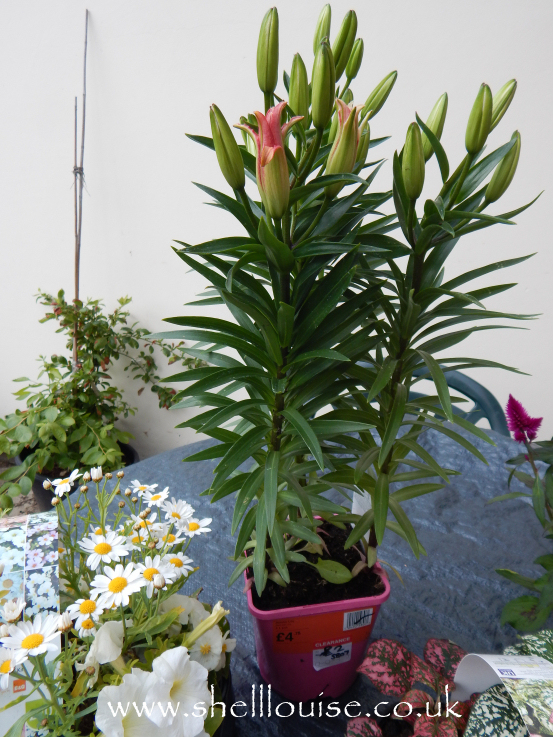 I decided I’d rather use the pot for something nicer than a dying tree so that pot got a makeover as well. 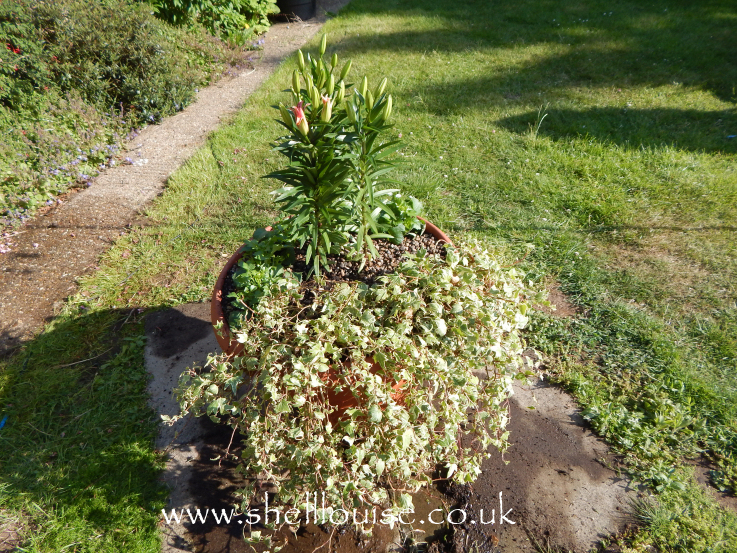 I really enjoyed filling all the pots but the effect was lost due to the grass under the arch being overgrown and very messy. It can’t be mown because I’ve planted some sweet peas and didn’t want to damage them so I spoke to Ant and came up with another solution. The grass was removed and weed matting put down. The slab was laid (with Ant’s help!) on the sand and the sides were covered with gravel. 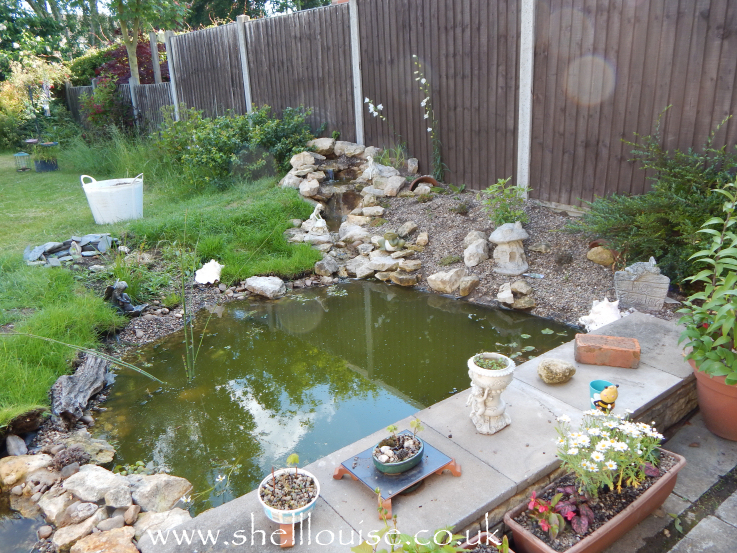 Your garden looks amazing, especially the water feature. Love how neat the lawn edge is. 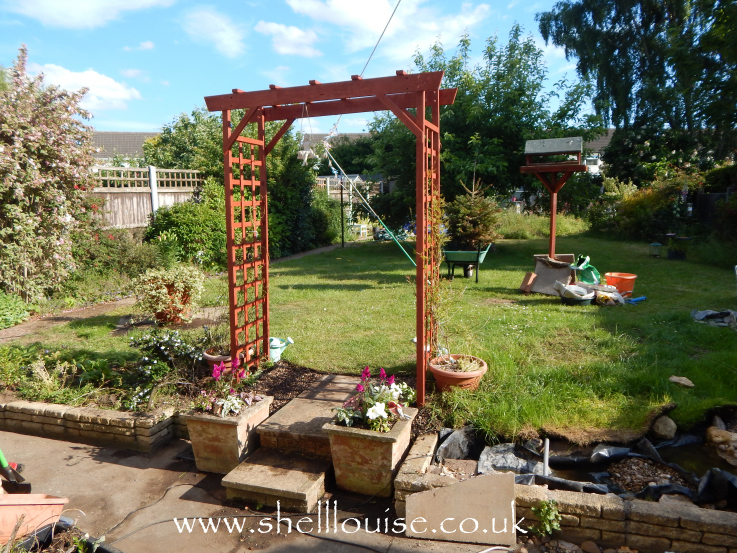 Gosh that's so impressive – I love your garden and wish I was a bit ore green-fingered! Wow your garden is really coming along. It is looking amazing. well done. 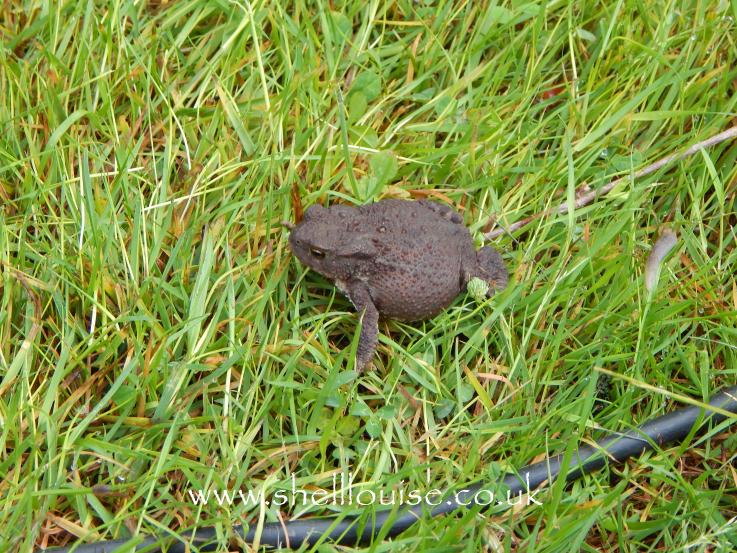 You've been really busy – I love your pond! We have just grown our first raspberries, which feels like a real achievement! 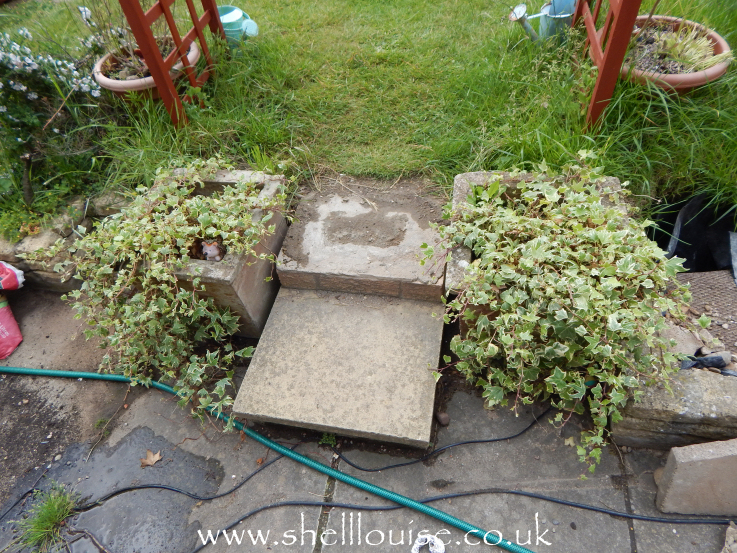 Your water feature is great – must have taken a lot of work. 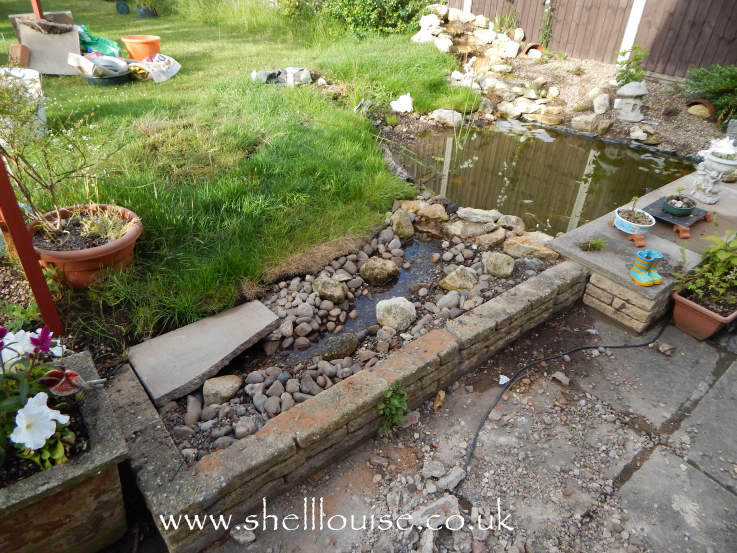 The stream and pond are looking great, fingers crossed you wont need to tinker with them any more. Oh you have been busy in the garden. 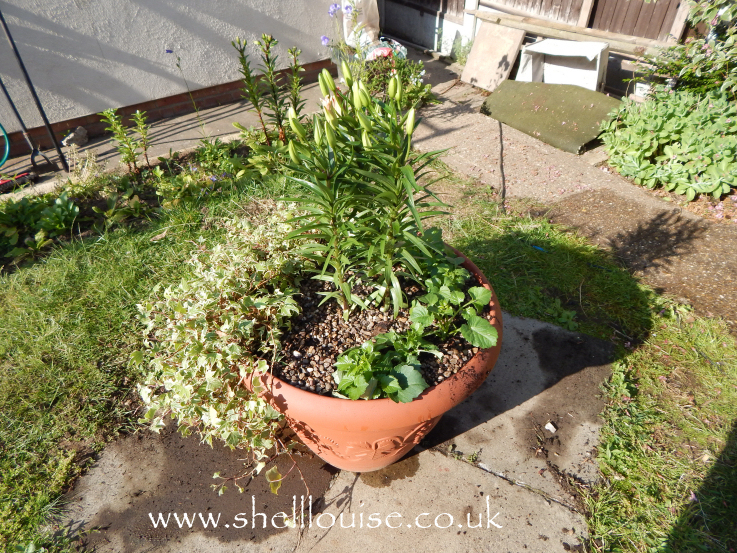 The water feature looks great so I hope it behaves itself so you can keep enjoying it throughout the summer. 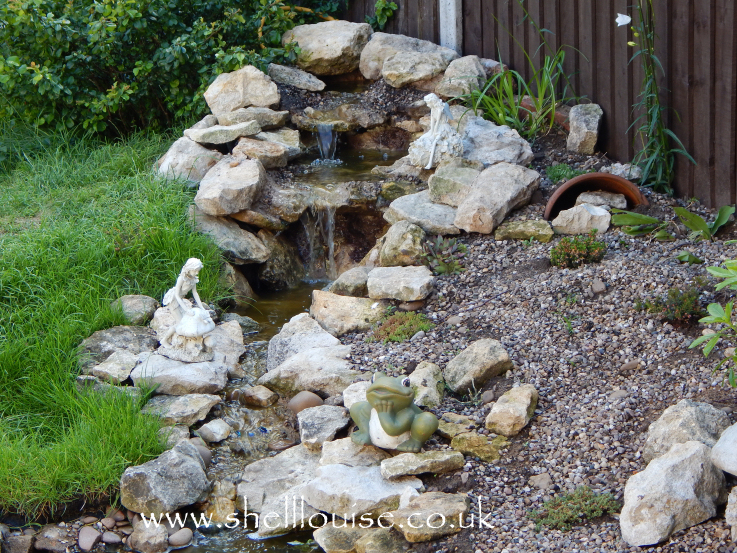 Oh I love your waterfall and stream – so lovely for you but also great for wildlife. 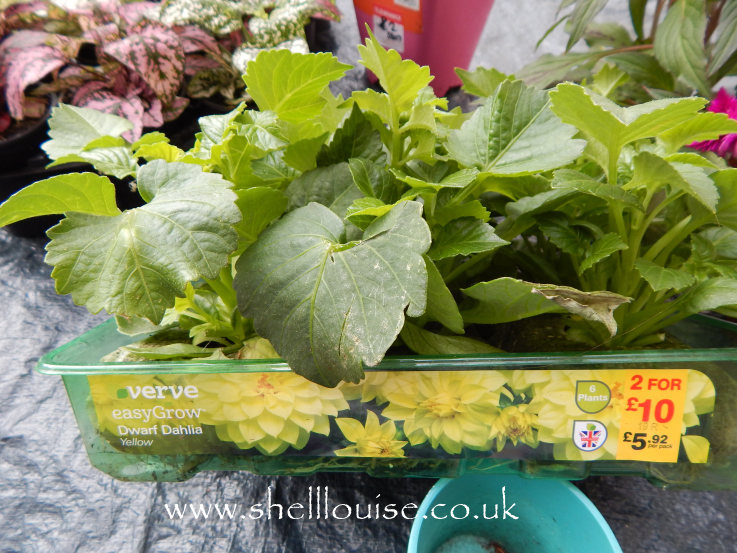 Like you I ordered a huge quantity of perennial plug plants earlier this year – brilliant for filling gaps in the garden but as usual I've ordered way too much and am now offering little plants to anyone who'll listen! Brilliant having a little stream in your garden! 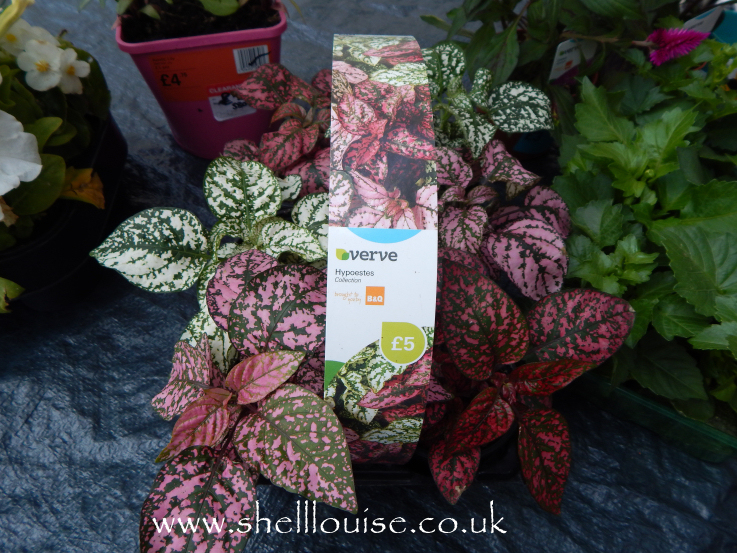 Looks so lovely with all your plantings. 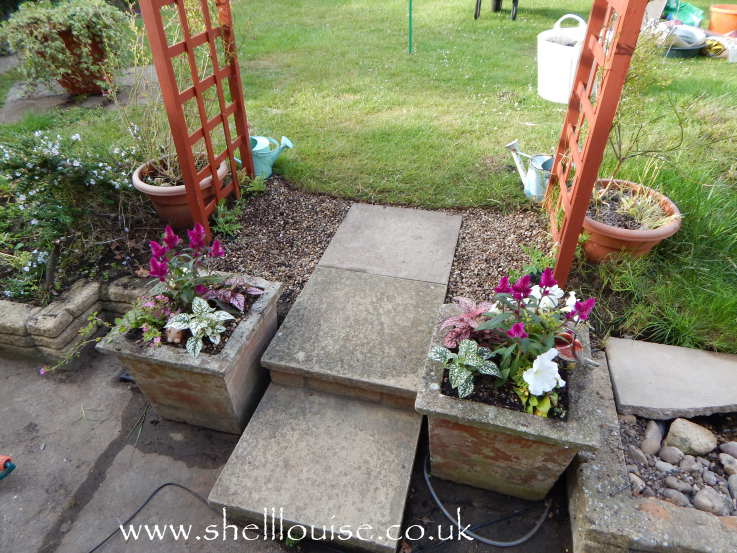 Your garden's looking great, love the makeover of the archway steps!